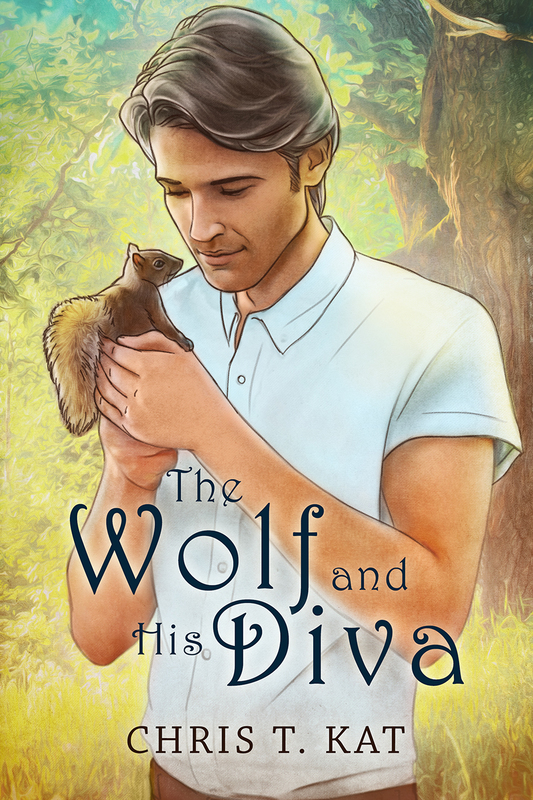 Hello, I’m Chris T. Kat and I’m here to talk about my new release, The Wolf and His Diva, a m/m shape-shifter romance which will be published by Dreamspinner Press on March 12th. The Wolf and His Diva started its life as a free story early in 2013. At that point I joined a group of flash fiction writers (you can find us at https://wedbriefsfic.com/) and the story was called “To Love a Fox”. I had to stop writing the story because of several books in the production line as well as an increased workload in real life. But—irritating how there’s always a but, isn’t it?—the story wouldn’t let go of me. So, in only a few weeks time, I wrote the whole story and voila! Here you have the full novella about George and Billy. Our group has grown a lot in the past few months and now we even have our own website. If you’re interested in reading free stories, I’d suggest looking at our site every Wednesday and checking out the new chapters/stories. The members of our group support each other and I made some very good friends there. Everyone is nice and welcoming and sometimes quite interesting discussions take place. Most of these discussions aren’t serious, but great fun to read. As I said before, I couldn’t finish George and Billy’s story due to lots of obligations. However, I missed the group and rearranged my writing schedule so I’m now able to participate again. At the moment I’m writing a paranormal m/m story, called Hope (http://christikat.blogspot.de/p/blog-page.html). George and Billy were special to me because they share a bond that intensifies as the story unfolds. It was fun to write about their connection and how they perceived it. George is older, calmer than Billy, who is the diva of the house. Even though there doesn’t seem to be a lot of common ground between them, they are deeply attuned to each other. I hope you’re curious to find out more about George and Billy’s love story! Billy pushed George’s face away and stepped aside. For a moment, George watched him nose the ground and paw at the snowflakes sticking to his snout. George sighed inwardly before turning his gaze back to their house, gauging how long it would take them to clear a path until they could open the front door. George jerked his head around, but before he could do anything, Billy had already tackled him to the ground. He oomphed but played along, relieved Billy obviously wasn’t too put out by the prospect of snow shoveling. They tussled in the snow, enjoying their time together. When Billy’s playful bites became too much for George, he shook him off easily. It’s not fair that you always win! Billy complained. But I’m the big bad red fox! Uh, big bad red fox? You got something wrong there. Isn’t it the big bad wolf? George growled in response and shifted into his other animal form—a large, dark-gray wolf. It always amused him to see Billy’s reaction—a surprised yelp and a jump backward. This time Billy’s yelp turned into a helpless gasp. George blinked several times, trying to clear his vision. For whatever reason, shifting from one animal to another played havoc with his eyesight. When he finally had a clear view again, he stared ahead, trying to understand what was happening. Billy scrabbled for purchase on the frozen ground, his eyes wide in fear. Nothing he did stopped him from sliding down the slope of the hill faster and faster. George gasped when Billy gave up the fight against gravity, curled himself into a tight ball and shot down the steep hillside. This entry was posted in Guest Author and tagged Chris T. Kat, Meet The Author, MM Romance, New Release, The Wolf and His Diva, Wednesday Briefs on March 10, 2014 by wedbriefsfic.